Nagpur. The soldiers risk their own lives to protect us from foreign aggressions. They remain ever vigilant to protect our borders. We must remember them not only at the time of war but always as we remembers the god from the bottom of our hearts in our daily life, appealed Rashtriya Swayamsevak Sangh (RSS) Sarsanghchalak Dr. Mohan Bhagwat Ji. He was addressing the unique “Prerana Sangam” organised as part of the ongoing “Dharma Sanskriti Mahakumbh” at the Reshambag ground, Nagpur on 24 December, 2016. Saints and soldiers are saviours of humanity in true sense. Soldiers protect nation and its borders, similarly, saints protect human beings by making them aware of ‘moral borders’. The union of saints and soldiers sharing a common platform is a historic event, observed RSS Sarsanghchalak Dr. Mohan Bhagwat Ji here. Jagadguru Shankaracharya of Jyotishpeeth Vasudevananda Saraswati presided over the “Prerana Sangam”. Union Minister of Home Hansraj Ahir, Energy Minister of MP Paras Jain, Archana Chitnis, former Admiral N C Vij, former General Syed Ata Hasnain, MP Yogi Adityanath Maharaj, were the guests of honour. National convener of Dharma Sanskriti Mahakumbh and Peethadheesh of Devnath Mutt Anjangaon Surji Jitendranath Maharaj, Rashtra Sevika Samiti Pramukh Sanchalika Shantakka, IG CRPF AP Singh, Mayor Pravin Datke, Air Marshal Bhushan Gokhale, Col. Sunil Deshpande, Col G S Jolly, Prashant Hartalkar, and others were prominently present. RSS Sarsanghchalak said that immediately after independence, the government should have taken steps to organise such event. Unfortunately, the government failed to recognise the contribution of saints and soldiers in nation building. He hoped that the “Prerana Sangam” would spread the message of unity, harmony, peace and prosperity to masses. Through this event the entire nation would recognise the sacrifices of soldiers and selfless services of saints to the society, he said. Describing this “Prerana Sangam” as an initiative to make society realize the sacrifices of the soldiers, Dr. Bhagwat Ji said that the entire nation should recognize sacrifice of soldiers and take care of their families. The saints also preach society to inculcate sense of belonging, encourage soldiers and share their pain, he added. He added that the entire country remembers soldiers at the time of war, but once war is over, the country tends to forget them. This was not expected, he added. How we can live without remembering the God, he asked. We need to remember and worship the God to make our life liveable. Similarly, we must remember soldiers who keep our borders secure and make our life liveable risking their own lives. Remembering their sacrifice daily would be equivalent to practicing nationalism, he said. 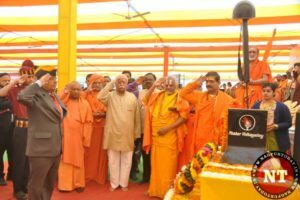 Shankaracharya Swami Vasudevanand Saraswati Ji while speaking on the occasion said that in ancient times sages were holding Vedas in one hand and carrying bows and arrows on their backs. Now that role has been shared between the saints and soldiers. Air Marshal Bhushan Gokhale commemorated the sacrifice of soldiers in protecting national boundaries. 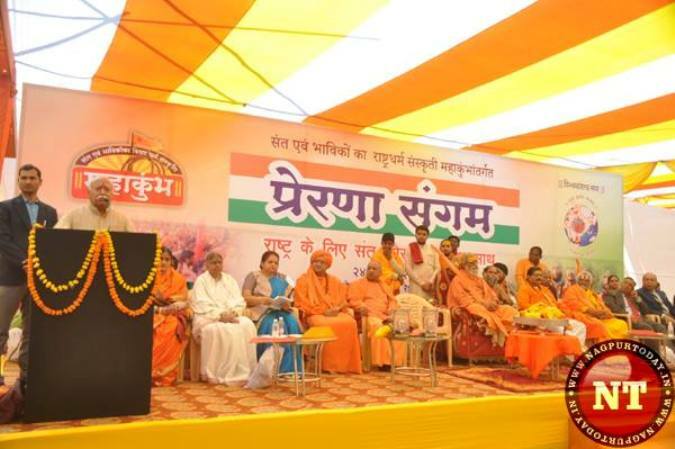 He hoped that the Dharma Sanskriti Mahakumbh would definitely bring in positive change into society. The country stands by soldiers at the time of war, but now there is a need to stand behind them all the time. The theme of the programe was “Sant se Sena Tak” (From Saint to Army) and to spread the message of “Rashtra Dharma”. On this occasion, 150 “Veer Patnis” (widows of the martyrs) and “Veer Matas” (Mothers of the soldiers) were honoured and felicitated by the saints. The soldiers who earned medals were also felicitated. The saints vowed to stand behind soldiers with full strength and inspire “Atmabal”. Vishwa Mangalya team rendered patriotic song “Jago Bharat ke Jawano” while Amarjyoti was lit. 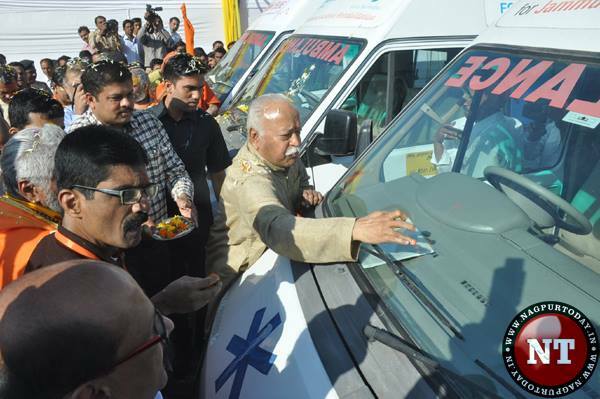 Three cardiac ambulances sponsored by the Borderless World Foundation were handed over by Dr. Mohan Bhagwat Ji to Jammu and Kashmir. RBI Divisional Director Jyotika Wanjani, Dy Commissioner of Police Ranjankumar Sharma, and Director of Fire Fighting School Jayant Pathak were also present on the occasion.